The story of Snow White and the Seven Dwarfs tells the tale of a beautiful princess born with skin so fair and pure that her mother named her Snow White. After the Queen’s death, her father married a woman who was vain and wicked, and who would stand in front of a magic mirror asking who was the fairest woman in the land. The mirror always replied “My Queen, you are the fairest one of all”, until one day an answer came that threw her into a rage – Snow White was now the fairest woman in all the land. Snow White’s evil step-mother talking to her magic mirror ( Wikipedia). Snow White’s step-mother, furious at what the mirror had told her, ordered a huntsman to take her into the forest and kill her. But the huntsman felt sympathy for Snow White and let her free. Snow White came upon a small cottage and, feeling exhausted, collapsed into one of the beds and fell into a deep sleep. When she awoke, seven dwarfs were looking down upon her. They told Snow White she could stay with them as long as she cleaned and cooked. Snow White and the dwarfs lived in contentment until one day when the magic mirror told the Queen that Snow White was alive and was still the fairest of them all. The Queen disguised herself as an old woman and presented Snow White with a poisoned apple. After taking a bite of the apple, Snow White fell unconscious. The dwarfs, assuming she was dead, built a glass coffin and placed her inside. One day, a handsome Prince passed by and saw Snow White in the coffin. He fell instantly in love with her and convinced the dwarfs to let him take the coffin so he could give her a proper funeral. As he and some other men were carrying the coffin, they tripped over some tree roots causing the poisoned apple to dislodge from Snow White’s throat. She awakened and the Prince declared his love for her. They were married, and as all fairy tales go, they lived happily ever after. Snow White is Margarete von Waldeck? In 1994, a German historian named Eckhard Sander published Schneewittchen: Marchen oder Wahrheit? (Snow White: Is It a Fairy Tale?) , claiming he had uncovered an account that may have inspired the story that first appeared in Grimm’s Fairy Tales. Not everyone is convinced by Sander’s claim that Snow White’s character stems from the life of Margarete von Waldeck. According to a study group in Lohr, Bavaria, Snow White is based on Maria Sophia von Erthal, born on 15 June, 1729 in Lohr am Main, Bavaria. She was the daughter of 18 th century landowner, Prince Philipp Christoph von Erthal and his wife, Baroness von Bettendorff. After the death of the Baroness, Prince Philipp went onto marry Claudia Elisabeth Maria von Venningen, Countess of Reichenstein, who was said to dislike her stepchildren. The castle where they lived, now a museum, was home to a ‘talking mirror’, an acoustical toy that could speak (now housed in the Spessart Museum). The mirror, constructed in 1720 by the Mirror Manufacture of the Electorate of Mainz in Lohr, had been in the house during the time that Maria’s stepmother lived there. 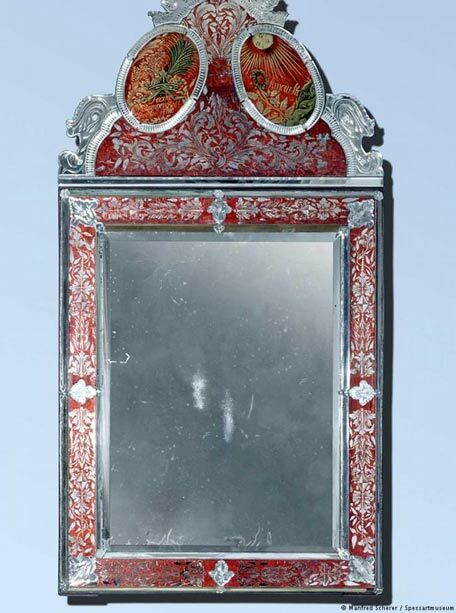 The ‘talking mirror’ constructed in 1720 that furnished the home of Maria’s stepmother, the Countess of Reichenstein. Credit: Manfred Scherer / Spessart Museum. The dwarfs in Maria’s story are also linked to a mining town, Bieber, located just west of Lohr and set among seven mountains. The smallest tunnels could only be accessed by very short miners, who often wore bright hoods, as the dwarfs have frequently been depicted over the years. The Lohr study group maintain that the glass coffin may be linked to the region’s famous glassworks, while the poisoned apple, may be associated with the deadly nightshade poison that grows in abundance in Lohr. It may never be known where the story of Snow White and the Seven Dwarfs truly originated as Grimm’s fairy tales were often an amalgamation of events that really occurred, mixed in with fantasy and imagination. Still, there is little doubt that there was at least some historical basis to the famous fairy tale. Eckhard, Sander (1994). Schneewittchen: Marchen oder Wahrheit? According to "The Woman with the Alabaster Jar" by Margaret Starbird, The story of Snow White and Rose Red, and other similar fairy tales came out of Medieval Europe as allegories of the loss of the sacred marriage of Mary Magdalene and Jesus. Because in Medieval times, people didn't "just tell stories". Stories that got told and retold widely and survive down the ages were deliberate efforts to preserve coded knowledge about royal, spiritual, or political secrets, because they were dangerous ideas. Why do we not consider, that legend of Snow White is a legend, and the dwarfs are just fantasy part of a fairy tale added to a tale of some real living dutchess or queen etc., and not any children working in mines or other creature like small people ? I personally not think that this legend had happened in reality and later was just told in fantasy manner with different characters instead of original ! That's possible. Seven dwarves, like the seven demons Jesus drove out of Mary Magdalene, which people interpret as the seven deadly sins. Another theory I'd heard and found interesting was that the story was an Alchemical allegory - that the dwarves represented various elements or chemicals, etc.